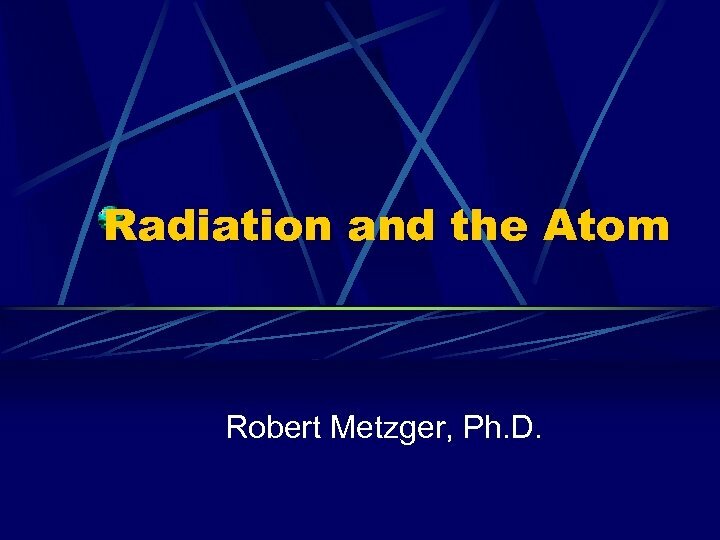 Radiation and the Atom Robert Metzger, Ph. 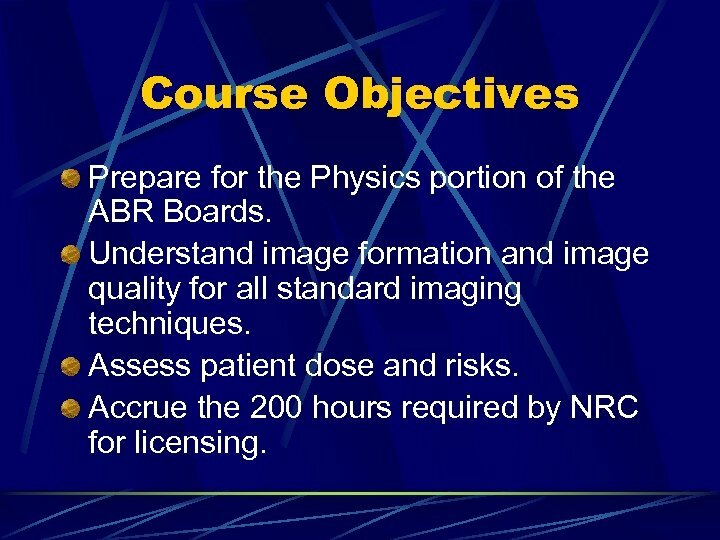 D.
Course Objectives Prepare for the Physics portion of the ABR Boards. Understand image formation and image quality for all standard imaging techniques. 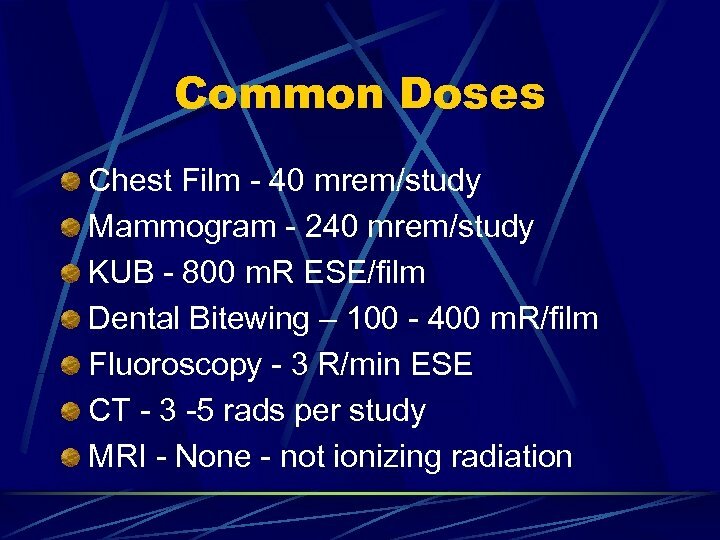 Assess patient dose and risks. Accrue the 200 hours required by NRC for licensing. Course Outline Approximately 100 hours of lecture, lab, and problem solving from July 2005 to June, 2006. 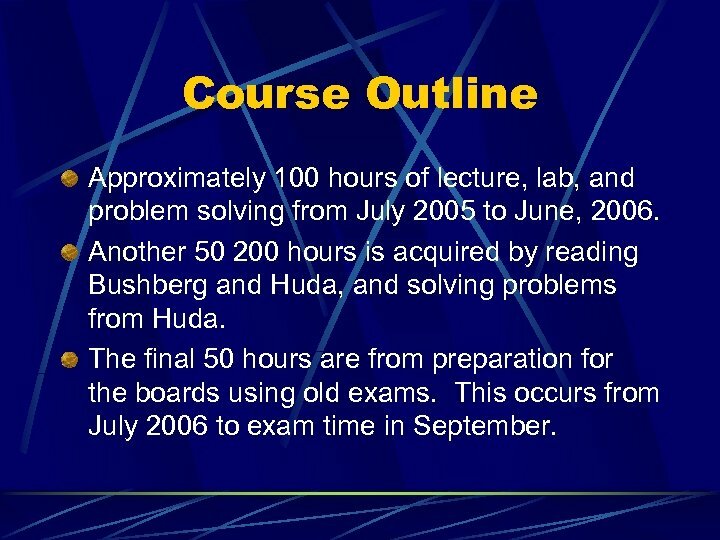 Another 50 200 hours is acquired by reading Bushberg and Huda, and solving problems from Huda. The final 50 hours are from preparation for the boards using old exams. This occurs from July 2006 to exam time in September. Course Structure Each Thursday we will meet for approximately 2 hours. The first 1 to 1. 5 hours will be lecture and the remainder will be taken up with problem solving and labs. 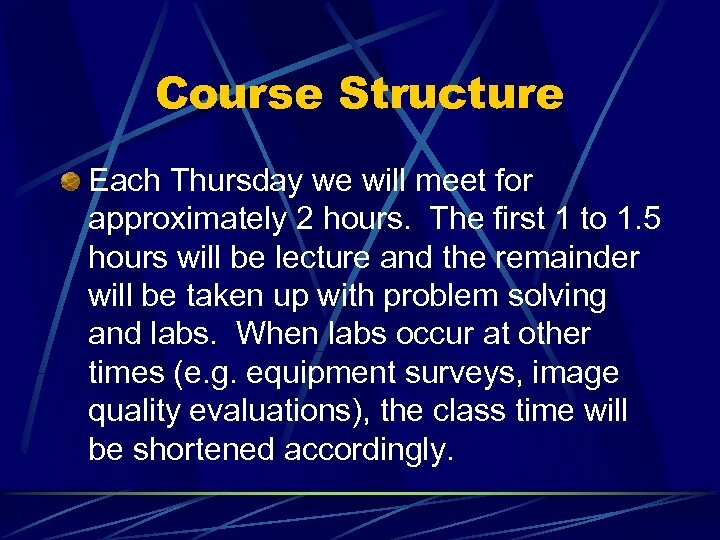 When labs occur at other times (e. g. equipment surveys, image quality evaluations), the class time will be shortened accordingly. 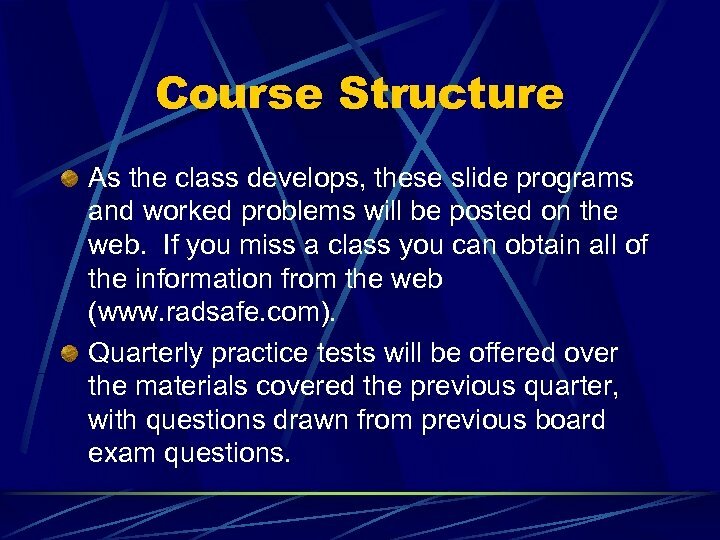 Course Structure As the class develops, these slide programs and worked problems will be posted on the web. If you miss a class you can obtain all of the information from the web (www. radsafe. com). Quarterly practice tests will be offered over the materials covered the previous quarter, with questions drawn from previous board exam questions. 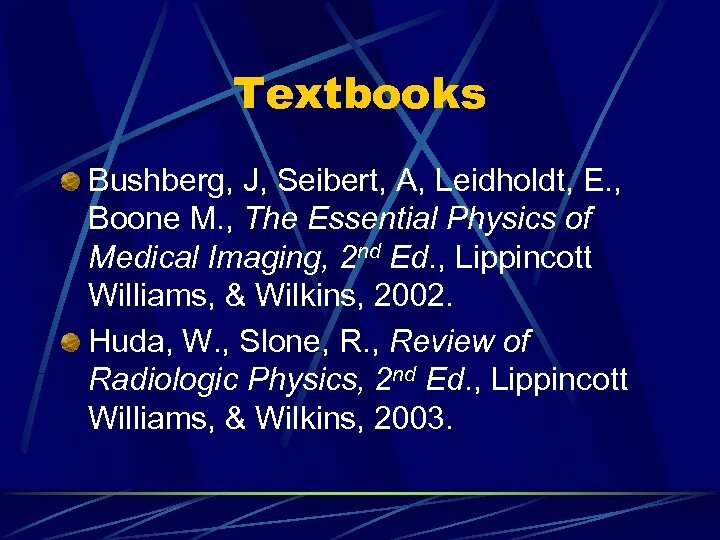 Textbooks Bushberg, J, Seibert, A, Leidholdt, E. , Boone M. , The Essential Physics of Medical Imaging, 2 nd Ed. , Lippincott Williams, & Wilkins, 2002. 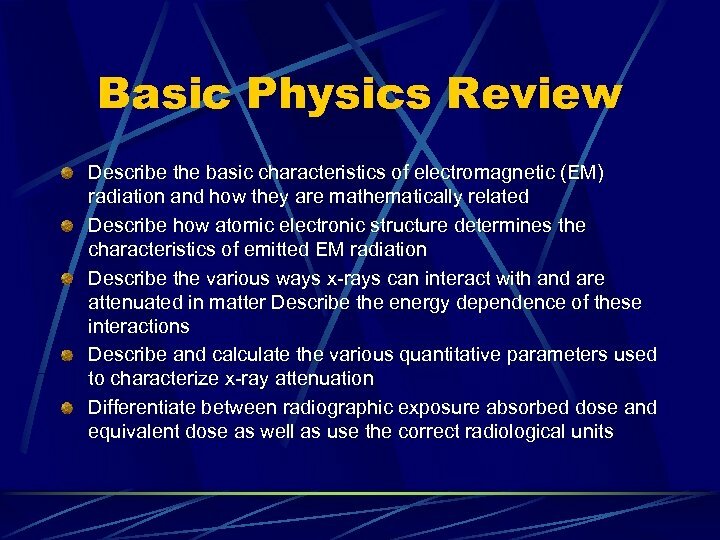 Huda, W. , Slone, R. , Review of Radiologic Physics, 2 nd Ed. , Lippincott Williams, & Wilkins, 2003. 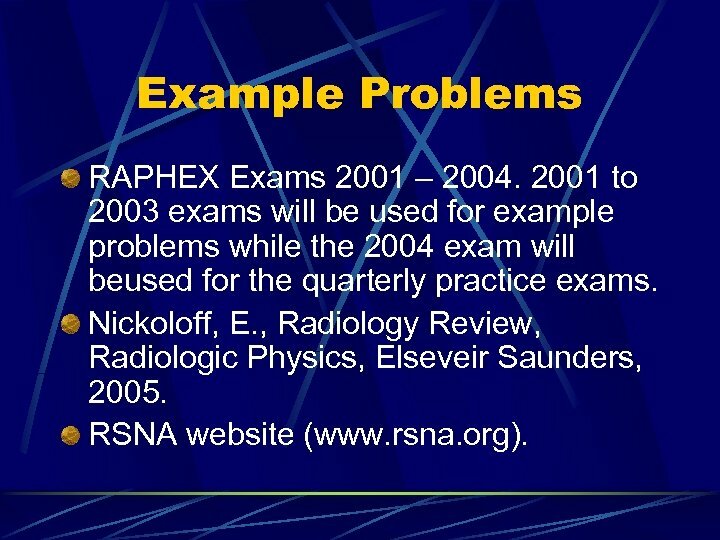 Example Problems RAPHEX Exams 2001 – 2004. 2001 to 2003 exams will be used for example problems while the 2004 exam will beused for the quarterly practice exams. 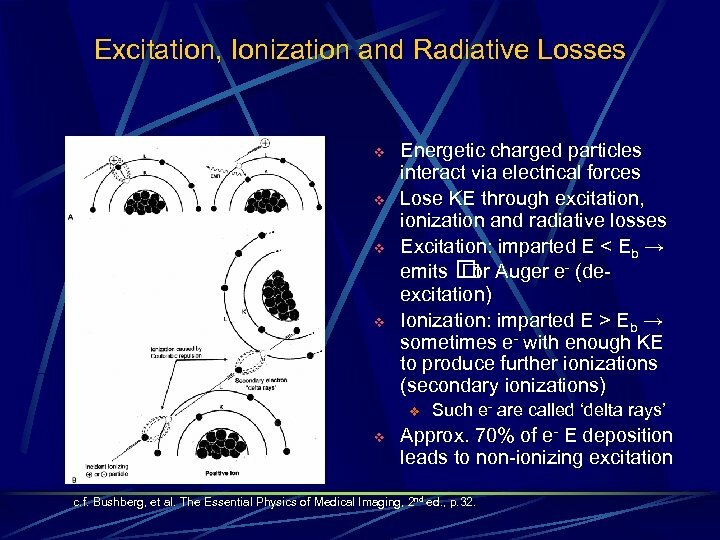 Nickoloff, E. , Radiology Review, Radiologic Physics, Elseveir Saunders, 2005. RSNA website (www. rsna. org). 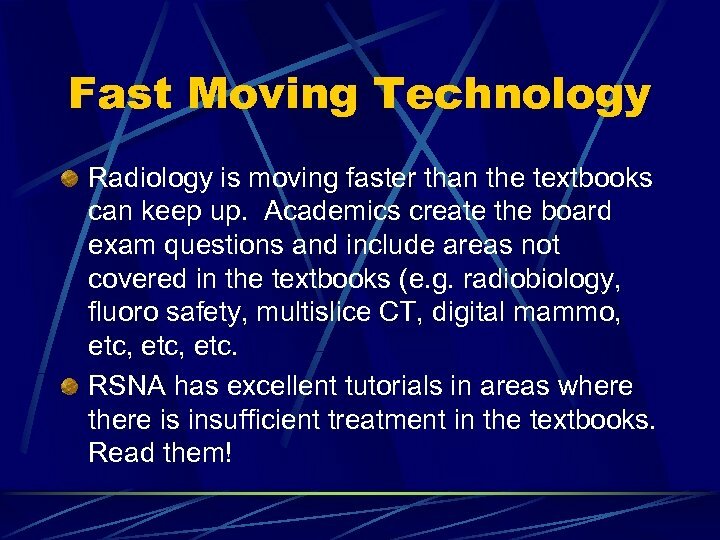 Fast Moving Technology Radiology is moving faster than the textbooks can keep up. Academics create the board exam questions and include areas not covered in the textbooks (e. g. radiobiology, fluoro safety, multislice CT, digital mammo, etc, etc. 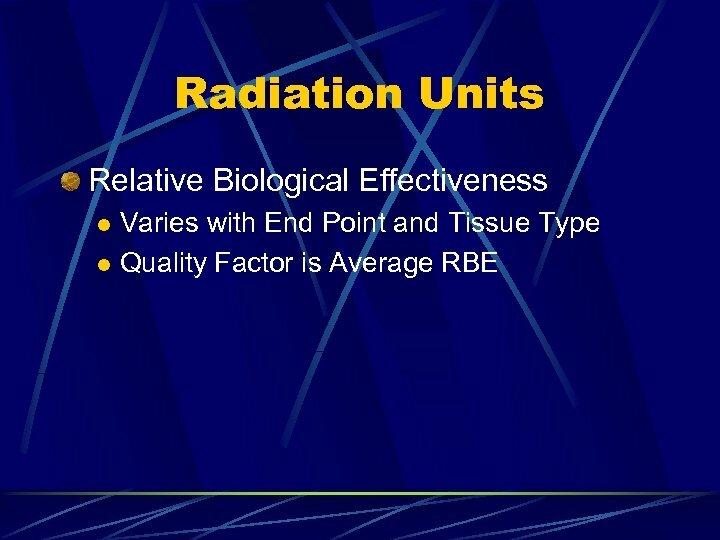 RSNA has excellent tutorials in areas where there is insufficient treatment in the textbooks. Read them! 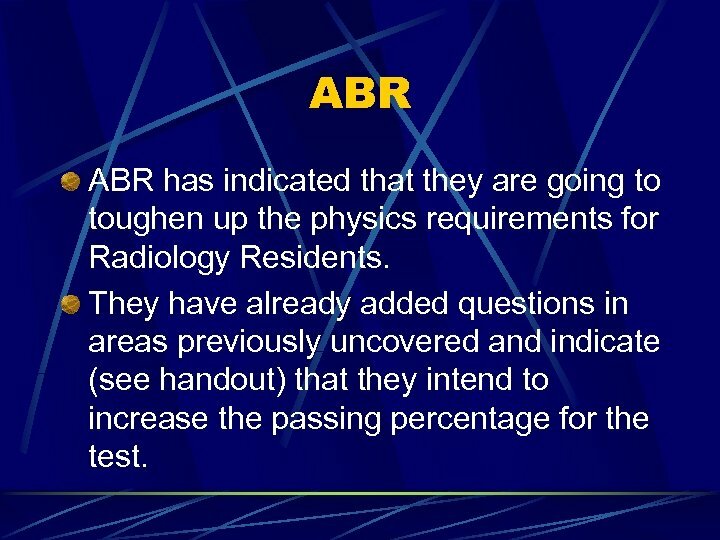 ABR has indicated that they are going to toughen up the physics requirements for Radiology Residents. They have already added questions in areas previously uncovered and indicate (see handout) that they intend to increase the passing percentage for the test. 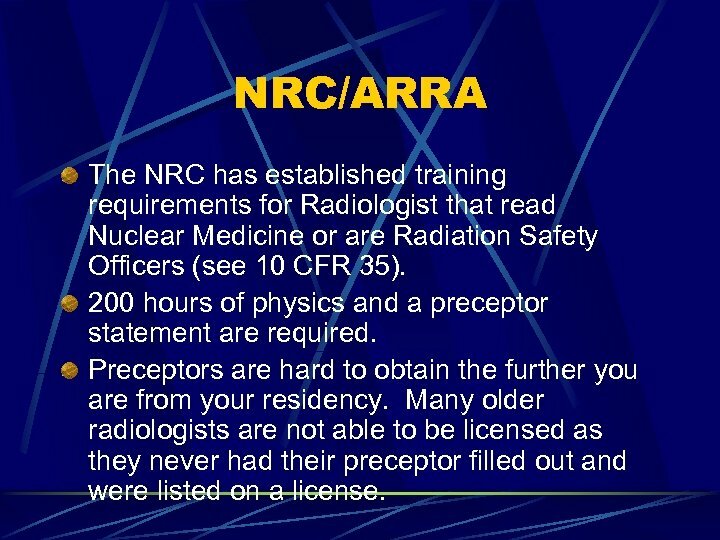 NRC/ARRA The NRC has established training requirements for Radiologist that read Nuclear Medicine or are Radiation Safety Officers (see 10 CFR 35). 200 hours of physics and a preceptor statement are required. Preceptors are hard to obtain the further you are from your residency. Many older radiologists are not able to be licensed as they never had their preceptor filled out and were listed on a license. 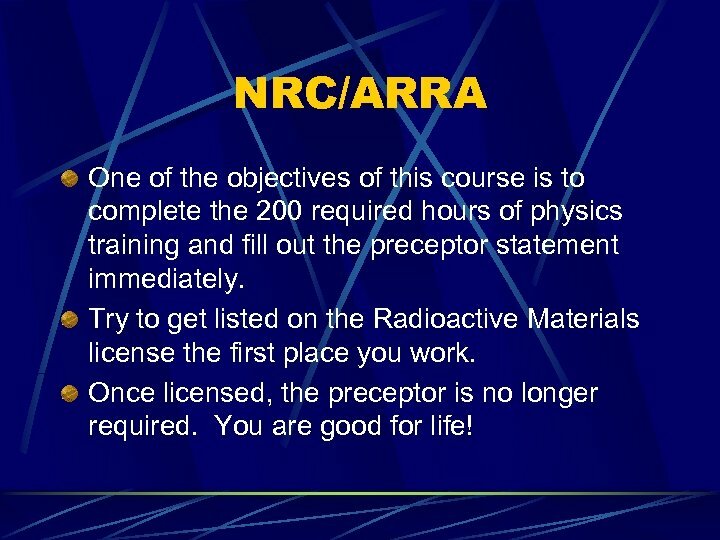 NRC/ARRA One of the objectives of this course is to complete the 200 required hours of physics training and fill out the preceptor statement immediately. Try to get listed on the Radioactive Materials license the first place you work. Once licensed, the preceptor is no longer required. You are good for life! 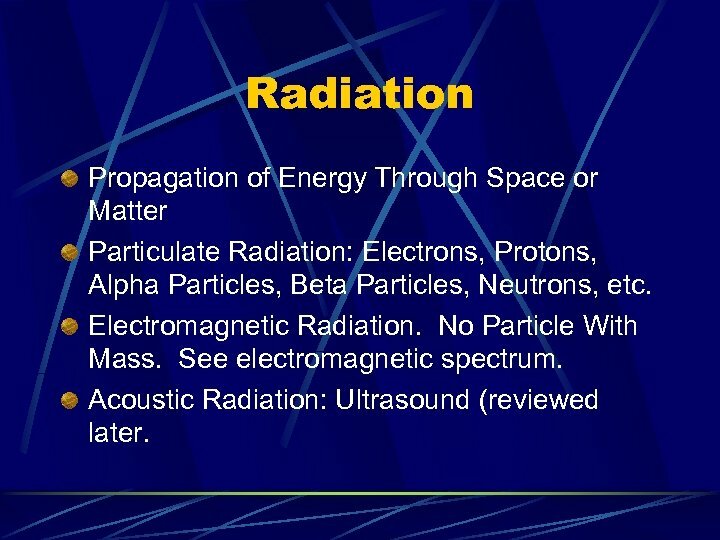 Radiation Propagation of Energy Through Space or Matter Particulate Radiation: Electrons, Protons, Alpha Particles, Beta Particles, Neutrons, etc. 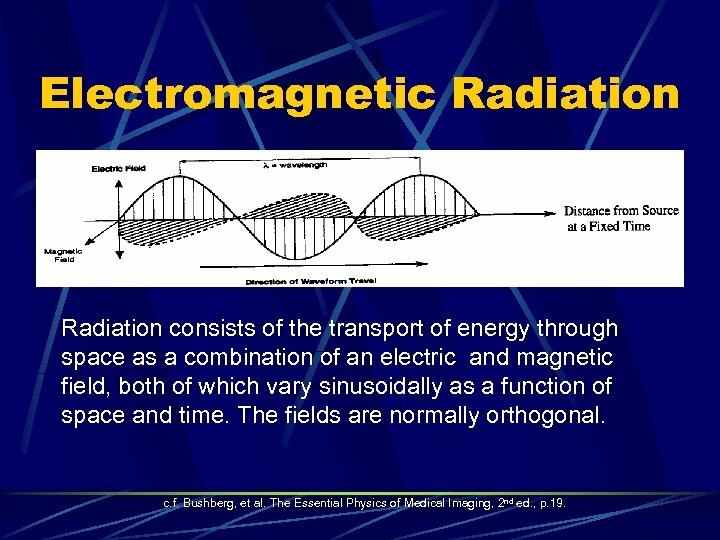 Electromagnetic Radiation. No Particle With Mass. 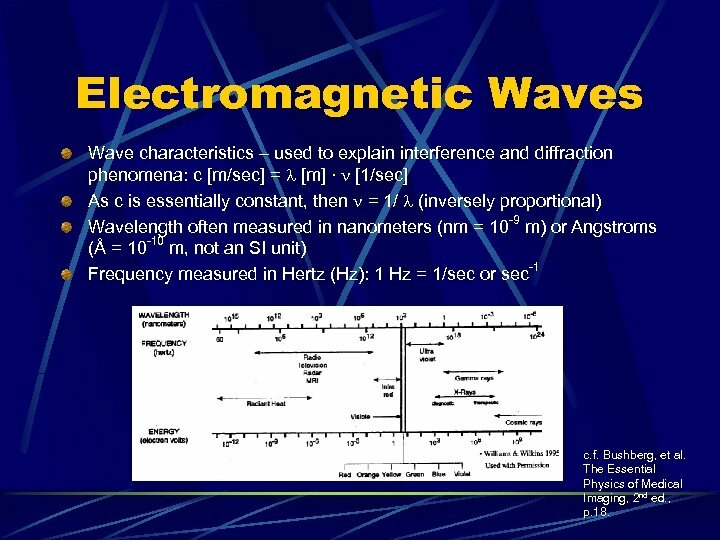 See electromagnetic spectrum. Acoustic Radiation: Ultrasound (reviewed later. 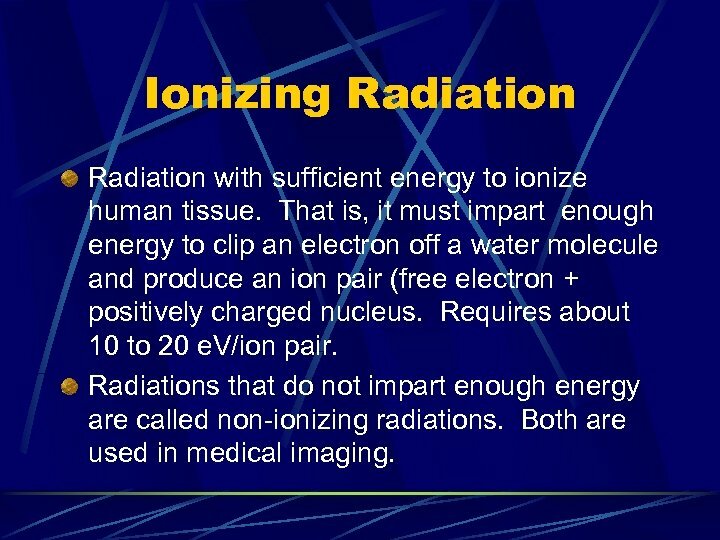 Ionizing Radiation with sufficient energy to ionize human tissue. 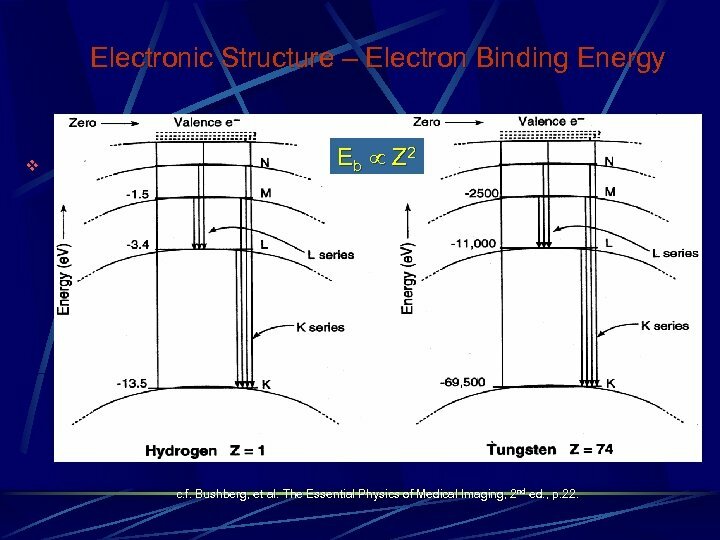 That is, it must impart enough energy to clip an electron off a water molecule and produce an ion pair (free electron + positively charged nucleus. 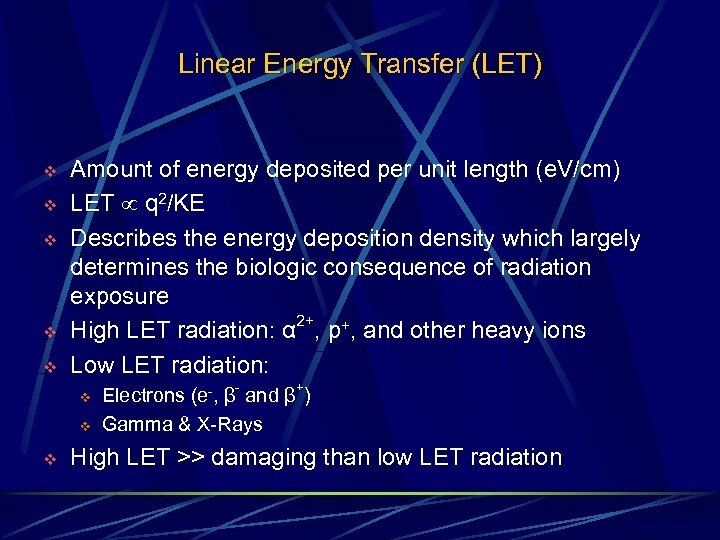 Requires about 10 to 20 e. V/ion pair. 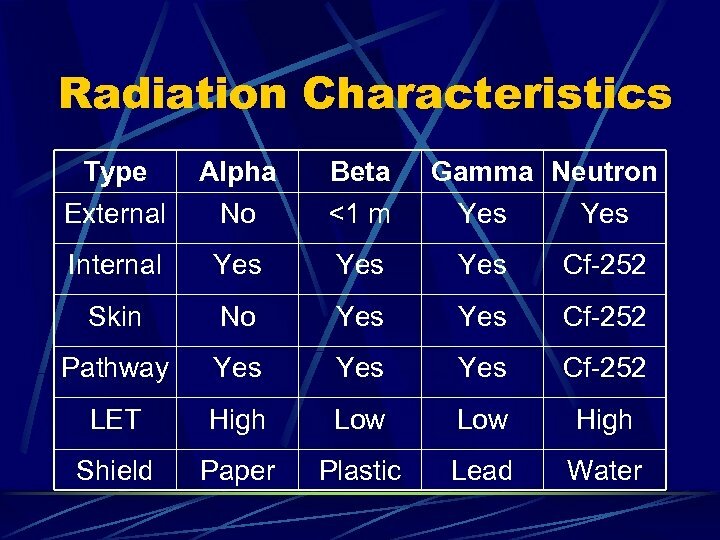 Radiations that do not impart enough energy are called non-ionizing radiations. 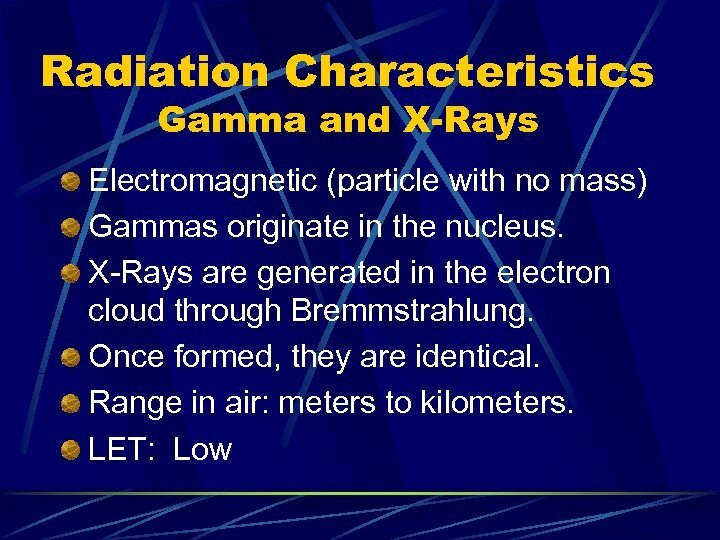 Both are used in medical imaging. 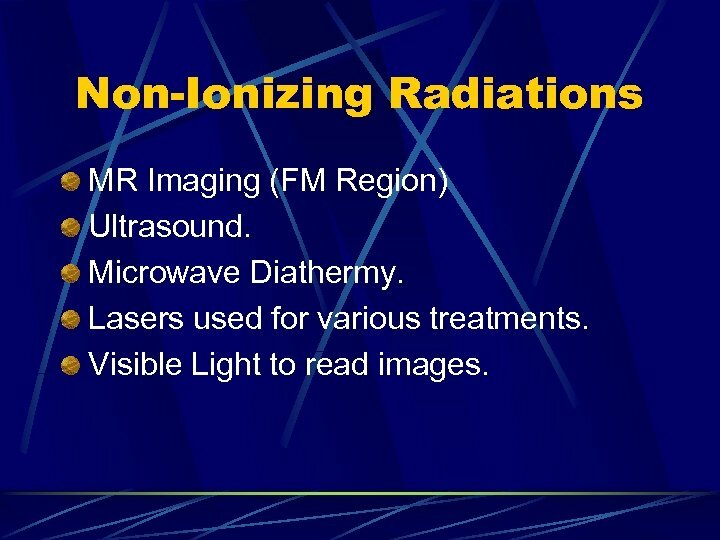 Non-Ionizing Radiations MR Imaging (FM Region) Ultrasound. Microwave Diathermy. Lasers used for various treatments. Visible Light to read images. 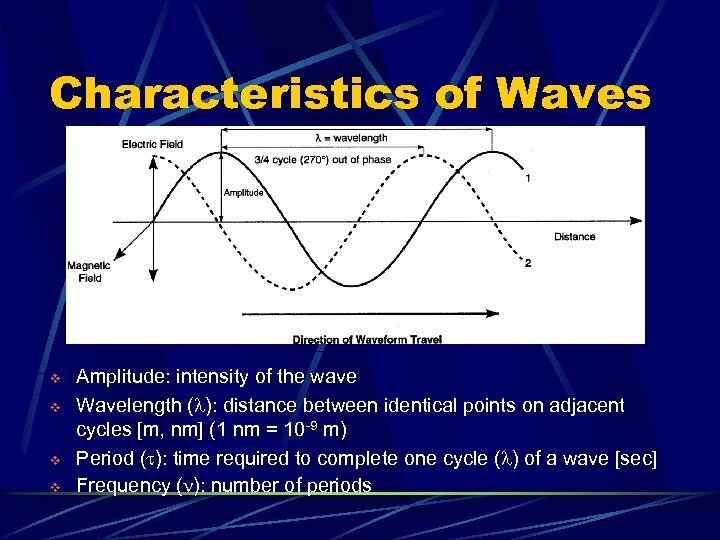 Electromagnetic Waves Wave characteristics – used to explain interference and diffraction phenomena: c [m/sec] = l [m] ∙ n [1/sec] As c is essentially constant, then n = 1/ l (inversely proportional) Wavelength often measured in nanometers (nm = 10 -9 m) or Angstroms (Å = 10 -10 m, not an SI unit) Frequency measured in Hertz (Hz): 1 Hz = 1/sec or sec-1 c. f. Bushberg, et al. 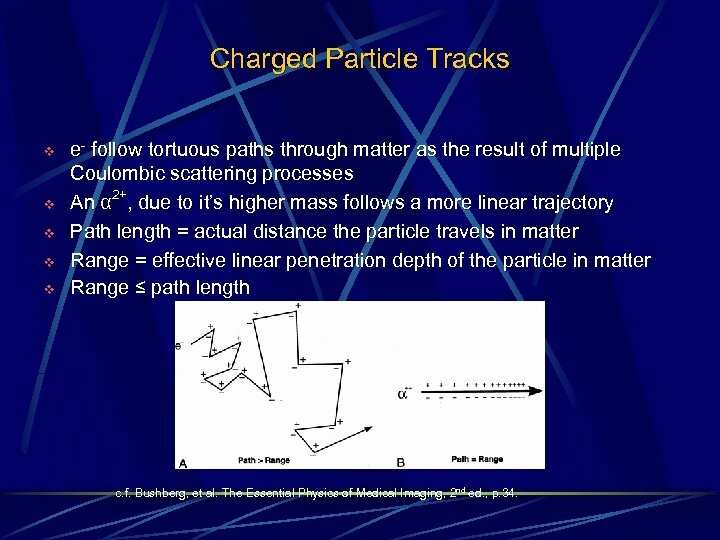 Bushberg, The Essential Physics of Medical Imaging, 2 nd ed. , p. 18. 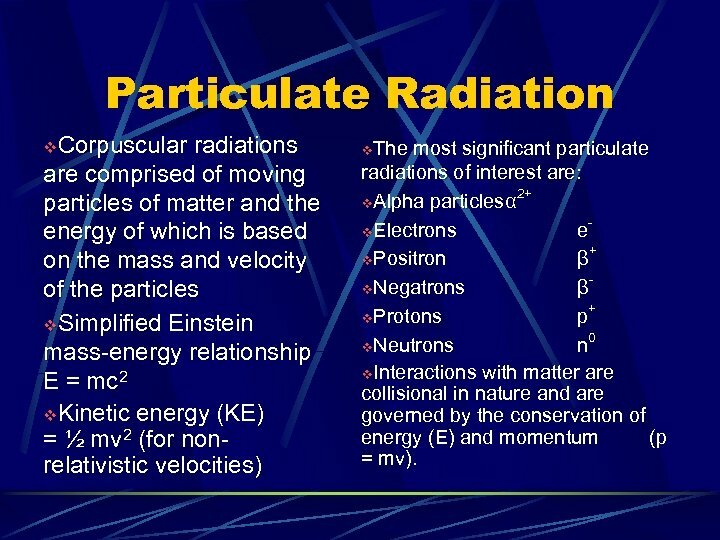 Particulate Radiation v. Corpuscular radiations are comprised of moving particles of matter and the energy of which is based on the mass and velocity of the particles v. Simplified Einstein mass-energy relationship E = mc 2 v. Kinetic energy (KE) = ½ mv 2 (for nonrelativistic velocities) v. The most significant particulate radiations of interest are: 2+ v. Alpha particles α v. Electrons ev. Positron β+ v. Negatrons βv. 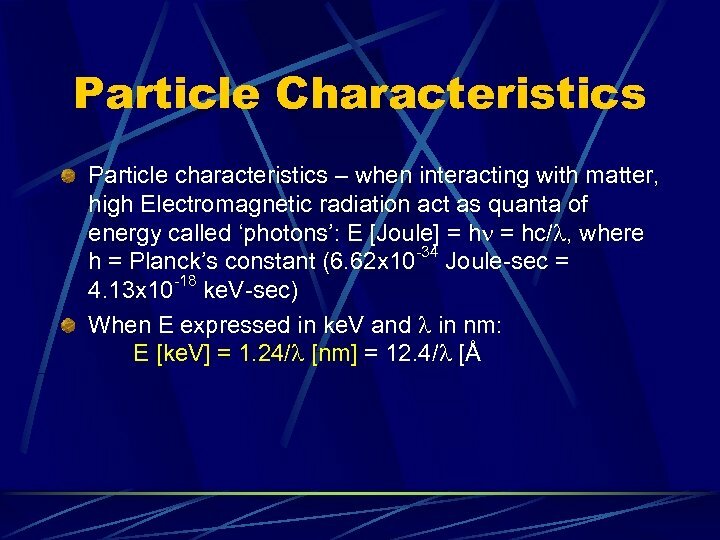 Protons p+ v. Neutrons n 0 v. Interactions with matter are collisional in nature and are governed by the conservation of energy (E) and momentum (p = mv). 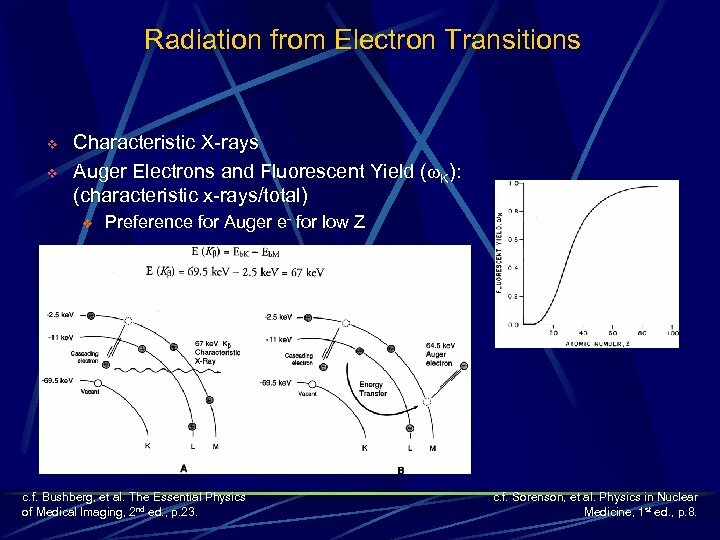 Radiation from Electron Transitions v v Characteristic X-rays Auger Electrons and Fluorescent Yield (w. K): (characteristic x-rays/total) v Preference for Auger e- for low Z c. f. Bushberg, et al. 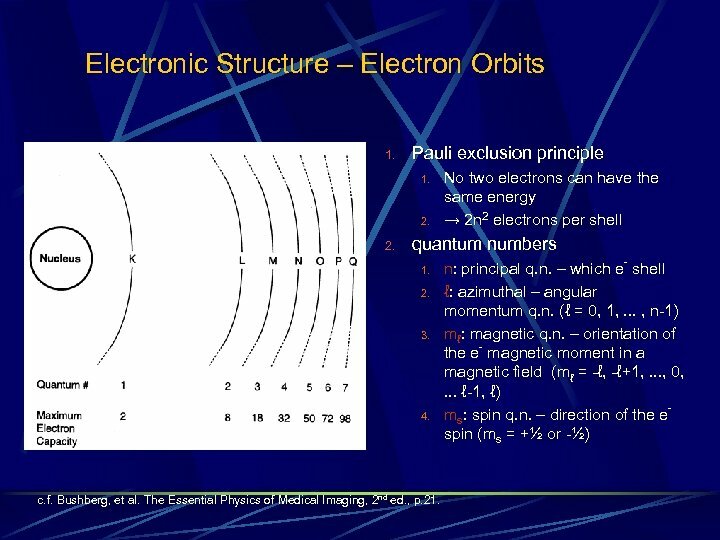 The Essential Physics Bushberg, of Medical Imaging, 2 nd ed. , p. 23. c. f. Sorenson, et al. Physics in Nuclear Medicine, 1 st ed. , p. 8. 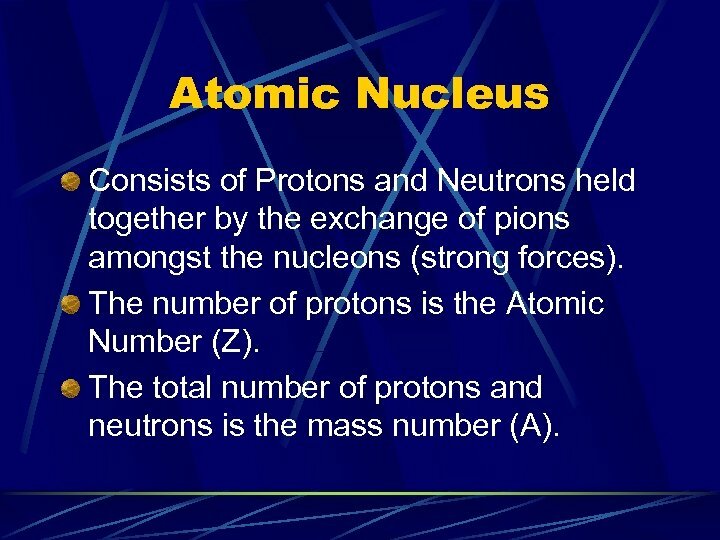 Atomic Nucleus Consists of Protons and Neutrons held together by the exchange of pions amongst the nucleons (strong forces). 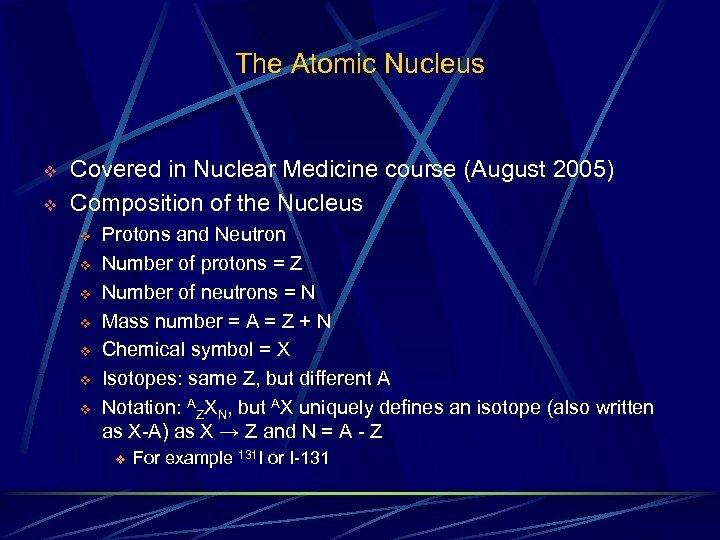 The number of protons is the Atomic Number (Z). 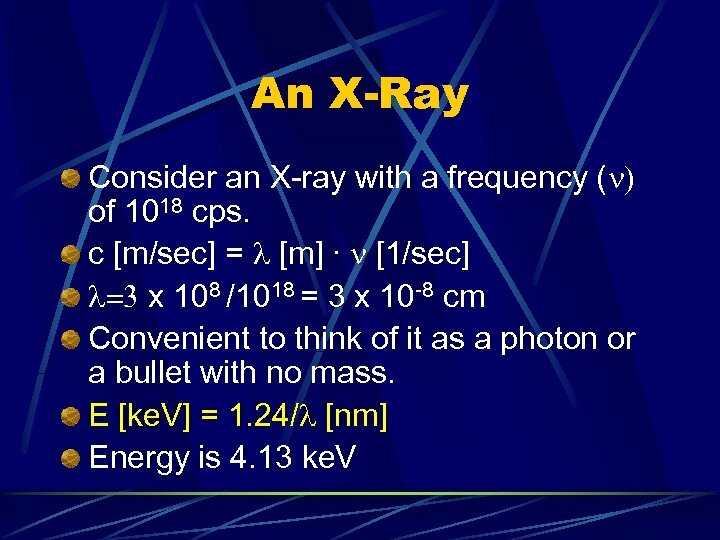 The total number of protons and neutrons is the mass number (A). 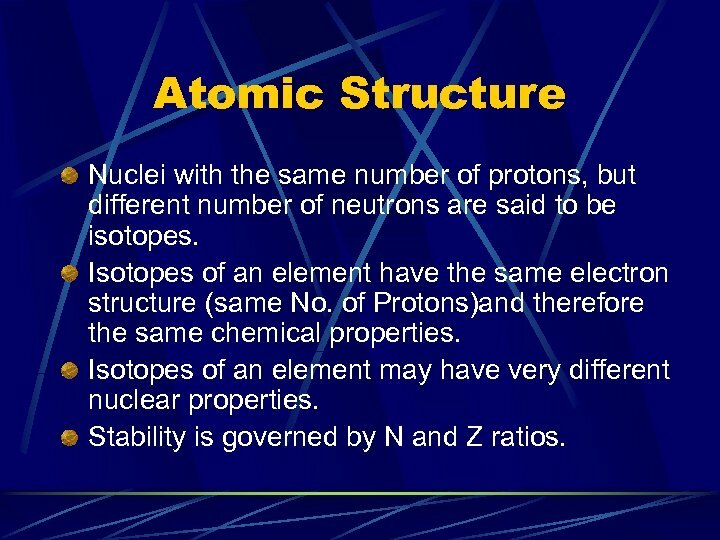 Atomic Structure Nuclei with the same number of protons, but different number of neutrons are said to be isotopes. Isotopes of an element have the same electron structure (same No. of Protons)and therefore the same chemical properties. Isotopes of an element may have very different nuclear properties. Stability is governed by N and Z ratios. 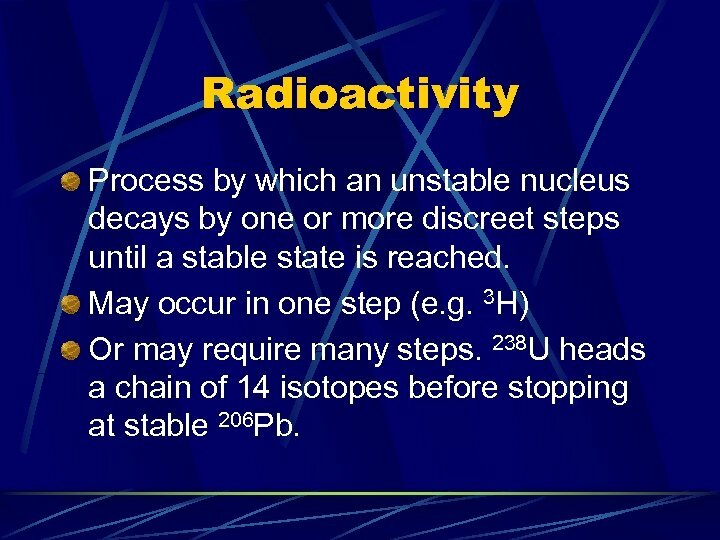 Radioactivity Process by which an unstable nucleus decays by one or more discreet steps until a stable state is reached. May occur in one step (e. g. 3 H) Or may require many steps. 238 U heads a chain of 14 isotopes before stopping at stable 206 Pb. 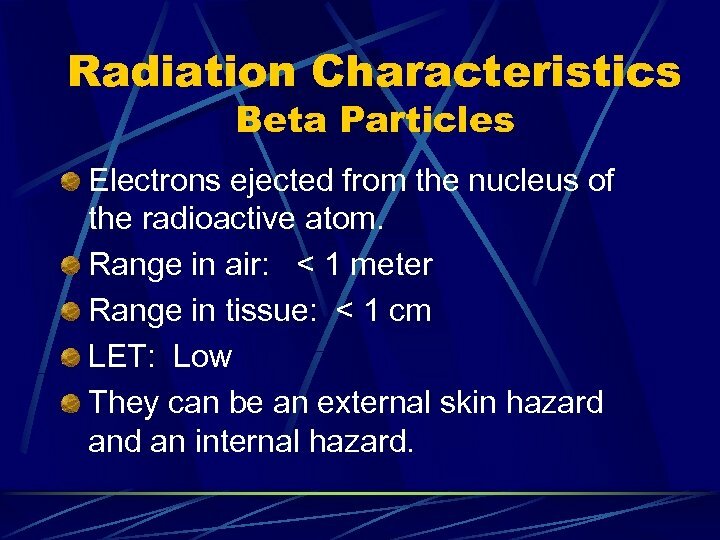 Radiation Characteristics Beta Particles Electrons ejected from the nucleus of the radioactive atom. 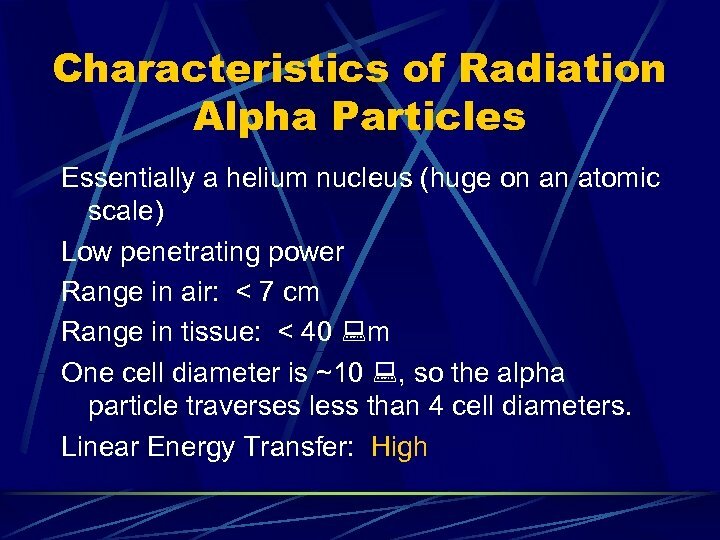 Range in air: < 1 meter Range in tissue: < 1 cm LET: Low They can be an external skin hazard an internal hazard. 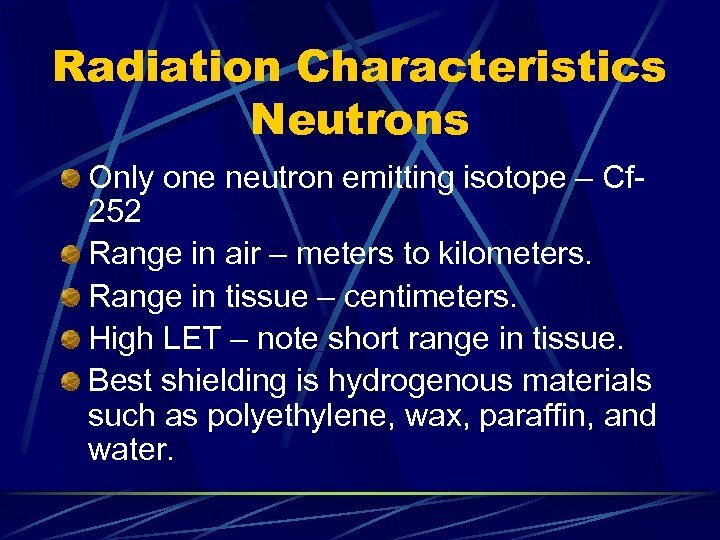 Radiation Characteristics Neutrons Only one neutron emitting isotope – Cf 252 Range in air – meters to kilometers. Range in tissue – centimeters. High LET – note short range in tissue. Best shielding is hydrogenous materials such as polyethylene, wax, paraffin, and water. Neutrons Nuclear weapons run on neutrons. Fissile materials (e. g. Pu-239, Uranium enriched in U-235) fission when struck by a neutron. 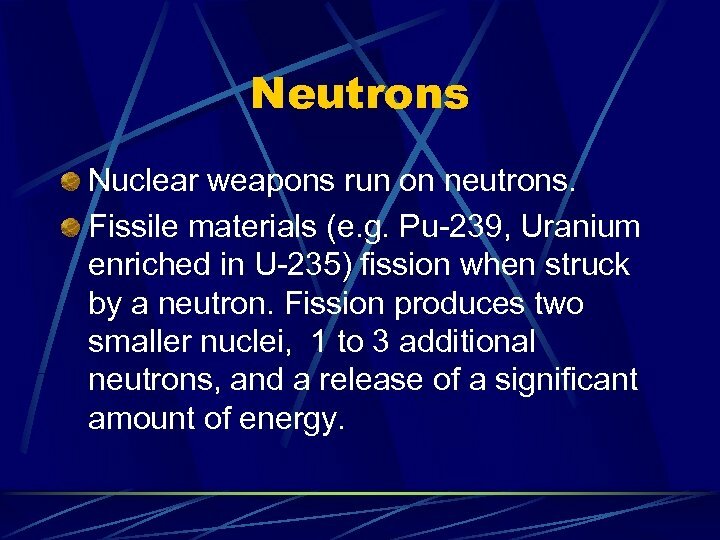 Fission produces two smaller nuclei, 1 to 3 additional neutrons, and a release of a significant amount of energy. 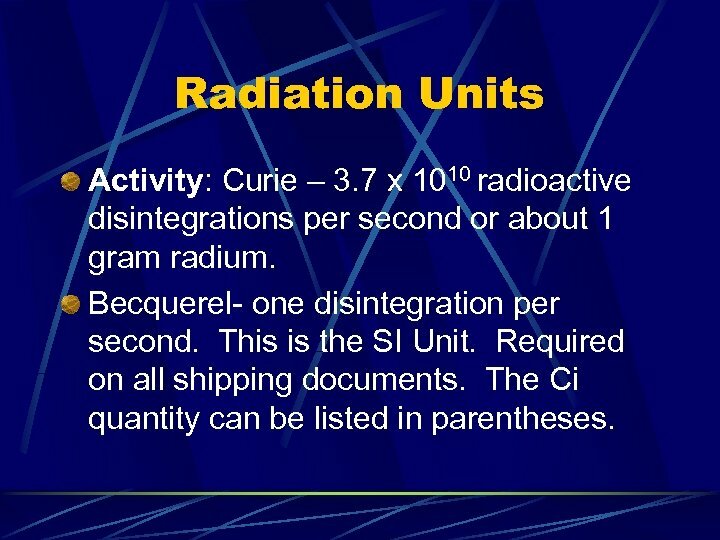 Radiation Units Activity: Curie – 3. 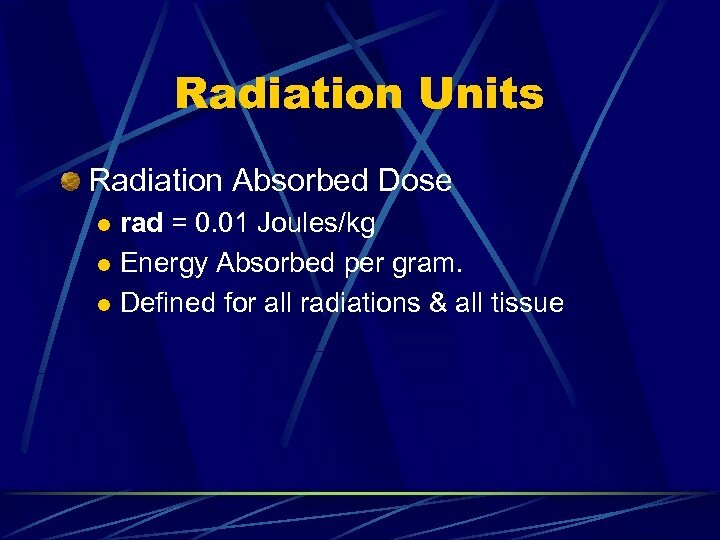 7 x 1010 radioactive disintegrations per second or about 1 gram radium. Becquerel- one disintegration per second. 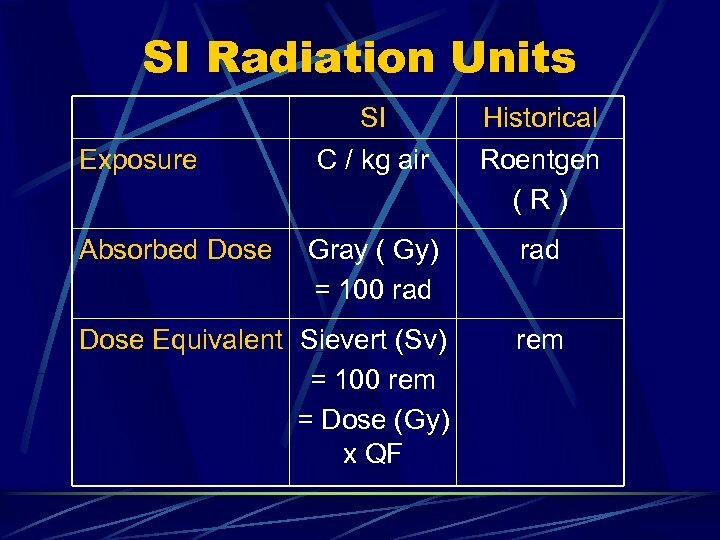 This is the SI Unit. Required on all shipping documents. The Ci quantity can be listed in parentheses. 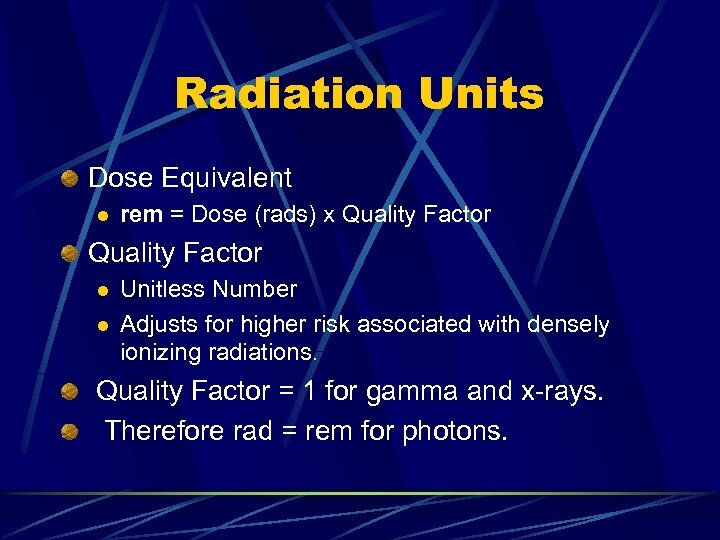 Radiation Units Dose Equivalent l rem = Dose (rads) x Quality Factor l l Unitless Number Adjusts for higher risk associated with densely ionizing radiations. 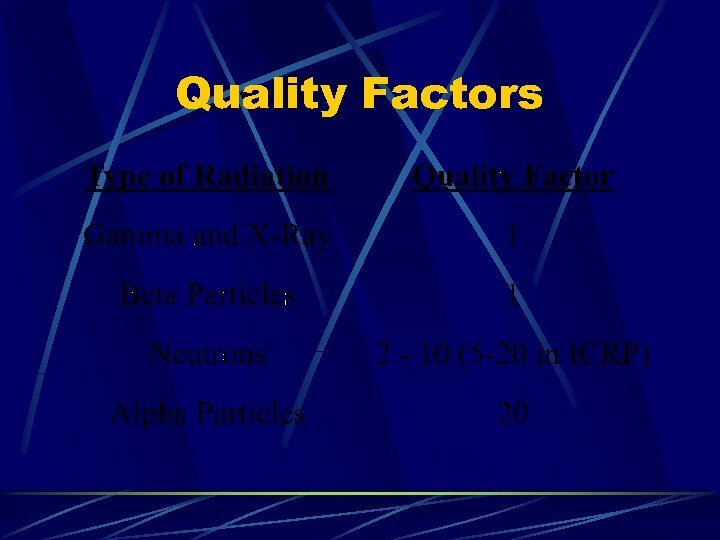 Quality Factor = 1 for gamma and x-rays. 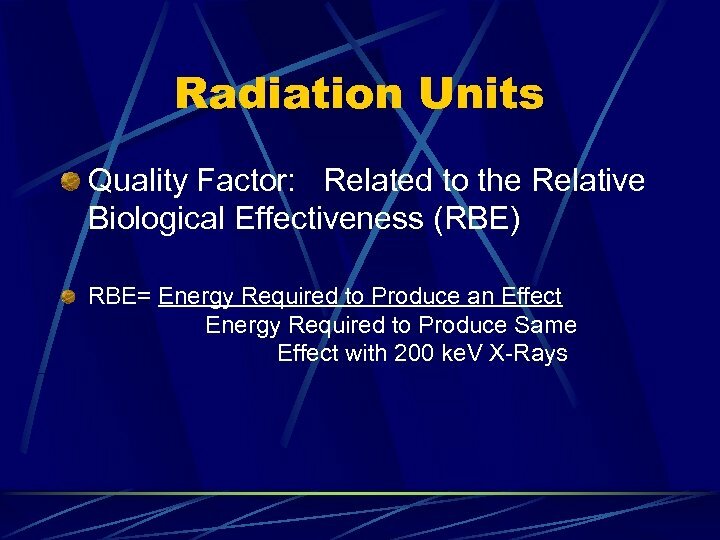 Therefore rad = rem for photons. 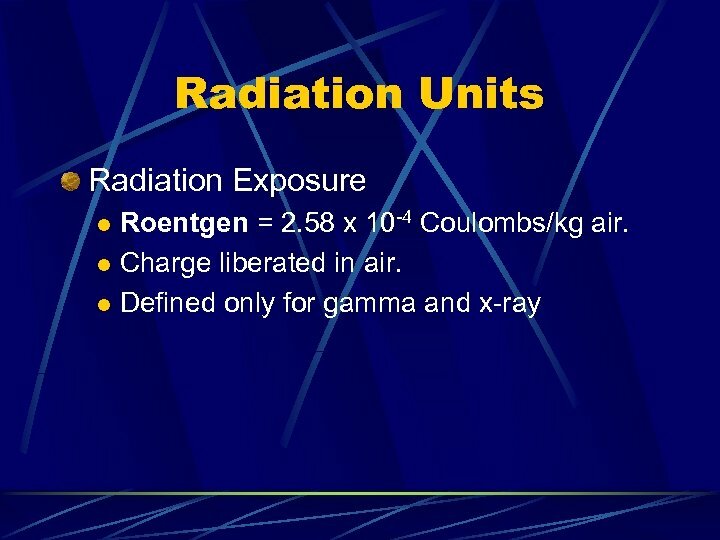 Units Concepts Exposure l l Roentgen Charge liberated in air Dose l l Rad or Gray Energy absorbed per kilogram Dose Equivalent l l l rem or Sievert Dose modified to reflect increased risk from densely ionizing radiations. The risk based unit. 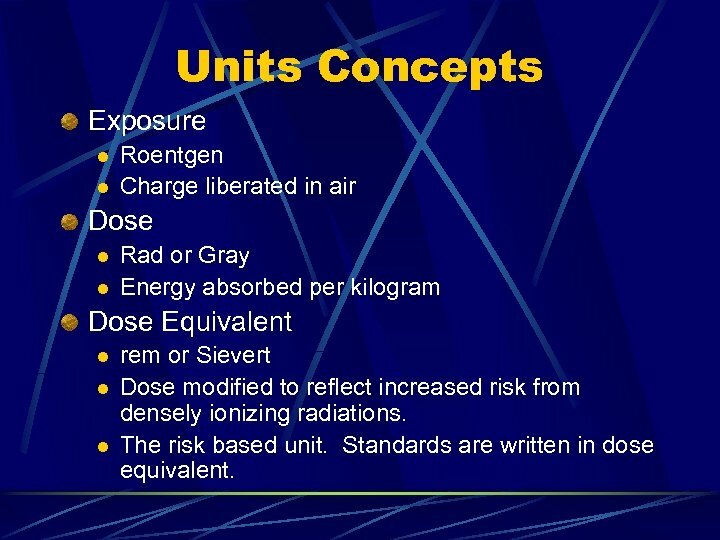 Standards are written in dose equivalent. 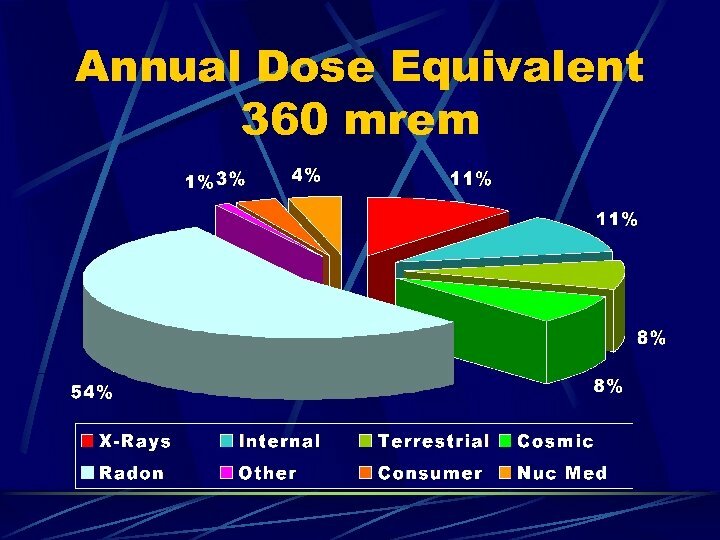 Annual Dose - Other 1% Occupational Dose – 0. 3% Fallout - <0. 3% Nuclear Fuel Cycle – 0. 1% Miscellaneous – 0. 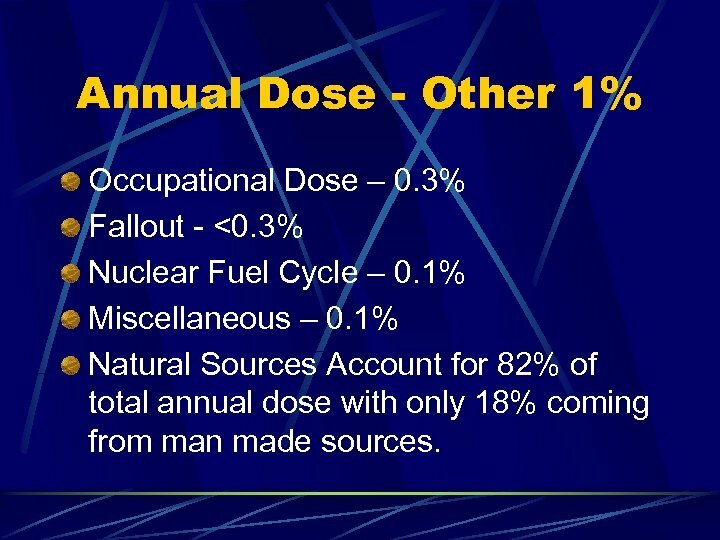 1% Natural Sources Account for 82% of total annual dose with only 18% coming from man made sources.